You glance over your shoulder and express your concerns to the man in the labcoat seated behind you. He responds only by insisting, “The experiment requires that you continue.” Conflicted, you return your gaze to a control board covered in switches, each marked with a voltage ranging from a meager 15 volts all the way to a lethal 450 volts. The one you just flipped was labeled 150, and your partner’s shouts of pain have made you hesitant about continuing. You signed up for this. You both did. “Persons Needed for a Study of Memory,” the advertisement had said. For four dollars and fifty cents, you had agreed to spend an hour participating in “a scientific study of memory and learning.” When you arrived at the testing center today, you were randomly assigned the role of “teacher,” while a fellow test subject was assigned the role of “learner.” Helpful assistants explained the whole experiment—you and your co-subject would be placed in separate, adjoining rooms, where you, through a microphone, would ask a series of multiple choice questions. For every incorrect answer, you were to flip switches that would deliver progressively higher electrical shocks to the learner. The experimenter seated behind you would gather data based on the learner’s responses. Both you and your co-subject agreed, and the experiment began. But now you are having doubts. Despite the assurance that the shocks would leave “no permanent tissue damage,” it’s clear to you that your partner is in enough pain to demand the end of the experiment. The experimenter, however, seems unfazed by the learner’s distress. Your every attempt to question the experiment has met with insistence that you continue with your assigned role. And so, with hesitation, you read the next question. Another wrong answer. Your finger hovers over the 175 volt switch as you look back again at the experimenter, who simply nods. In 1961, the atrocities of the Holocaust had not yet faded out of memory and into the history books of the world. As Adolf Eichmann went to trial for his crimes in organizing the wholesale slaughter of millions, a question lurked, unanswered and ominous: how? How could this have happened? How could an entire country of ordinary people become complicit in the deaths of so many innocents? What made the Holocaust possible? In July of that year, Professor Stanley Milgram of Yale University set out to find an answer. He devised an experiment to answer those very questions by examining how far the average human being would go in obedience to an authority figure. That experiment, as you might have guessed, included the very scenario presented at the beginning of this Sabbath Thought. Contrary to what the experiment’s volunteers believed, the study had nothing to do with memory or learning. The “test subject” in the role of the learner was only an actor and the electrical shocks were imaginary. The real subject of this study—and the only one unaware of its true purpose—was the teacher. Milgram wanted to see how difficult it would be to coerce an average individual into delivering what was essentially a 450-volt death sentence to another human being. His results are terrifying. Milgram had designed the experiment so that every teacher would hear the same protests from the learner. Beginning at 75 volts, the learner would grunt in response to the shock. At 120 volts, he would begin to complain about the pain. At 150, he would demand to be released from the chair. At 300 volts, the teacher would hear him pounding, demanding that the test ends. And at 330 volts, he falls silent. At this point, the experimenter informs the teacher that a lack of response should be interpreted as a wrong answer. As far as the teachers know, their partner is unconscious, or worse, dead. Every subject of Milgram’s original experiment paused to question its ethics—and yet, every single one of them eventually flipped the 300-volt switch. What’s more frightening is that, with the learner entirely unresponsive, 26 of the 40 test subjects went all the way to 450 volts. That’s 65 percent. Almost two-thirds of the participants administered what they believed to be a massive 450-volt shock to a complete stranger who was at best unconscious. The teacher featured in the above clip worriedly asks, “I mean, who’s gonna take the responsibility if anything happens to that gentleman?” When the experimenter replies, “I’m responsible,” the subject appears frustrated but continues with the test, despite the learner’s protests. But this subject wasn’t the only one with reservations—Milgram reported that participants were so troubled by their own actions that some of them were trembling, groaning, sweating, digging their fingernail into their skin, laughing nervously, and even experiencing seizures. In spite of their own obvious discomfort and concern about the experiment, the experimenter’s prods were enough to convince all 40 teachers to administer 300 volts and 26 to administer a deadly 450 volts. This time, the percentage is higher. Nine out twelve participants—seventy-five percent—make it to 450 volts. In every version of this experiment, the only reason test subjects seem to proceed is because of their belief that the experimenter had the authority to make them continue. Maybe you’ve heard others use some variation of that claim. Maybe you yourself have used it. It’s a common enough excuse that you’ve probably had some contact with it. But is it a good one? One of the biggest lies we can tell ourselves is that we don’t have a choice; that our hands are tied, so to speak. But the truth is, it doesn’t matter who told you to do it, what kind of authority they have, or how much pressure they’re exerting—you always, always have a choice. Even with a gun to your head, you have a choice. No amount of authority can take your decision to obey or disobey away from you. 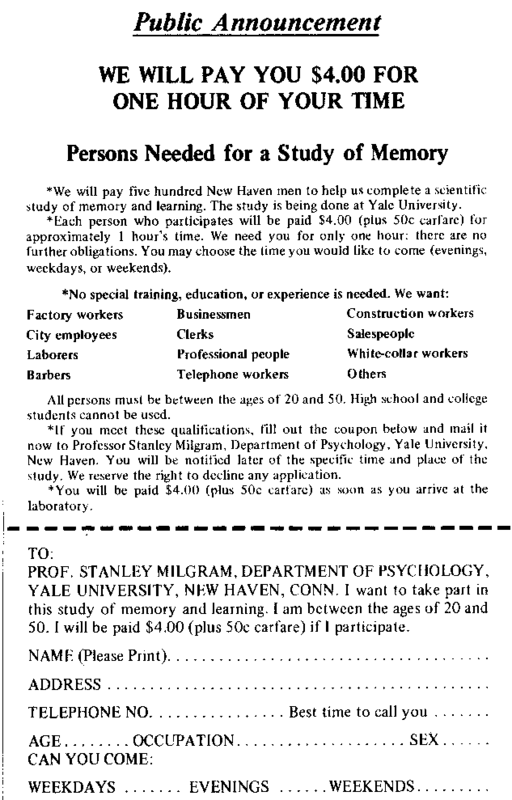 It’s worth noting at this point that the “experimenters” in Milgram’s tests were actors, not professors. They had no credentials or even authority to punish or reward, but their perceived authority was enough for the test subjects to put themselves through psychological torment in order to obey—as if by virtue of donning a lab coat, the experimenters gained some mystical superiority that demanded obedience. We all have lines in the sand—moral boundaries we believe we cannot cross. But the fact of the matter is this: an imposing authority figure is enough to convince most people to compromise that belief. If someone we perceive as “in charge” gives an order, morals are statistically more likely to crumble before obedience. It was the case in 1963, and it’s still the case today. Whose authority will you submit yourself to? Most of the men and women involved in Stanley Milgram’s obedience experiments hadn’t answered that question. When they found themselves torn between morals and obedience, they caved and followed the directions of a complete and total stranger whose only claim to authority was a piece of clothing and a confident demeanor. It’s little wonder, then, that we can so easily cave to the demands of someone capable of doling out punishments and rewards. I’ve been a little light on scripture throughout this Sabbath Thought. In fact, up until now, I haven’t so much as made a parenthetical reference. If this seems unusual, let me assure you that every word so far has been to frame one single verse—words spoken by apostles of God. Already having been thrown into prison once for their adherence to the gospel of the Kingdom, the apostles again found themselves standing before an incredulous band of authorities—the high priest, the captain of the temple, and the chief priests, all of them demanding that the apostles stop preaching the message given to them by Jesus Christ. “But Peter and the other apostles answered and said: ‘We ought to obey God rather than men'” (Acts 5:29). That’s it. That’s all there is to it. There are no buts, no ifs, no unlesses. Peter and the other apostles had already decided whose authority they would submit to, and it was not the high priest’s. Despite the risk of being thrown back into prison, these men made it clear: their obedience was to God before anyone else. No threat or punishment could weaken their resolve. Their next words only serve as reinforcement, reminding the opposing “authorities” that the “God of our fathers raised up Jesus whom you murdered by hanging on a tree. Him God has exalted to His right hand to be Prince and Savior, to give repentance to Israel and forgiveness of sins. And we are His witnesses to these things, and so also is the Holy Spirit [which] God has given to those who obey Him” (Acts 5:30-32). When we become Christians, we accept God as the highest and ultimate Authority—no buts, no ifs, no unlesses. It’s true that the Bible instructs us to be obedient to governing authorities (Romans 13:1) and to our leaders in the Church (Hebrews 13:17), but only insofar as they obey God (cf. 1 Corinthians 11:1). There will come times in our lives when each of us must choose between obeying God or man…and unless we prepare ourselves to make that decision now, our beliefs will crumble under pressure as well. We can’t make that choice in the moment. The man in the first video was less concerned with sticking to his morals than he was with finding out who was “gonna take the responsibility if anything happens to that gentleman.” He wanted assurance that he wasn’t responsible for his own actions—but he was. We’re all responsible for our own actions, and no one, not the leader of a country or even a minister of God, can take away that accountability by claiming authority over us. When we know something is wrong in God’s eyes, no amount of human authority or coercion can make it acceptable. Our actions are our own and we will answer for them. It’s sobering to think that something as dreadful as the Holocaust happened largely because so many were so willing to compromise their morals rather than oppose men who put on the lab coat of authority. When we compromise our morals, we compromise our integrity—we compromise who we are. And at the end of the day, that’s really all we can lay claim to. The character we’re building now determines whether or not we’ll have a place as kings and priests in the Kingdom of God. Are we so willing to throw that away because someone in this life insists upon it? As Joshua said all those years ago: “And if it seems evil to you to serve the Lord, choose for yourselves this day whom you will serve… But as for me and my house, we will serve the Lord” (Joshua 24:15). 8 Responses to "On Whose Authority?" Wow. Scary and insightful. Great article. Thank you for the encouragement to always do right the right thing, no matter what. We can be deceived so easily by people in authority, especially those we respect and trust. That is why Satan works so hard to deceive those who are in authority. The Pharisees were deceived. They thought they were right, but Jesus said they were blind. Many trusted them and were deceived. Humans always seem to make this authority discussion complicated, but like you said, it’s so simple. Thanks for another great post. Thanks for giving me food for thought today… and making me realize that I have to make a choice everyday to take responsibility for MY own decisions. An excellent point. I would be interested in your perception of Abraham and Isaac. Abraham was told to murder Isaac by the ultimate authority, and he is praised for being fully prepared to push the button.